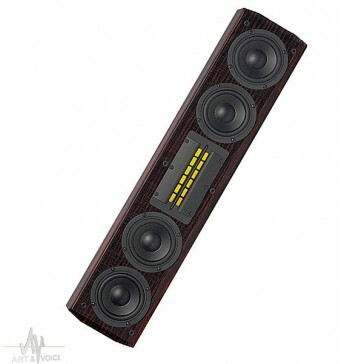 Sunfire CRS 3C The Cinema Ribbon Trios are built with the same acclaimed technology and craftsmanship of the Cinema Ribbon Duos, but feature dramatic performance upgrades that take them into a class all their own. The result? A 440-Watt, On-Wall tour-de-force that has absolutely no equal. The Trio line is purpose-built for on-wall mounting and matching to your flat panel video monitor. Their enhanced performance versus the Duo line is courtesy of one additional driver in the left and right channel speakers-and two additional drivers for the center channel. So whether you're looking to complement that new LCD display or you're building up a serious dedicated theater, the Cinema Ribbon Trio's prodigious power, High Back-emf drivers and hand-lacquered rosewood veneer cabinets make them the singular choice for every serious Home Theater devotee. Tweeter 6" Cinema Ribbon Woofer Four 4.5" Configuration Front-Firing Crossover Topology Tapered Array (2-1/2 way) High Back-emf Design Intelligent Tweeter Shaping - Enclosure Type Sealed Magnetically Shielded Binding Posts Gold Plated Bi-wire Capable Finish Ebonized Rosewood Grille Black Cloth Frequency Response 80Hz-40kHz Power Handling 25-440W Impedance 6ohm (nominal) Sensitivity 90dB SPL (max.) 117 dB Size (H x W x D) 5.8” x 28.0” x 3.75" Net Weight 19.8 lbs STÜCKPREIS!